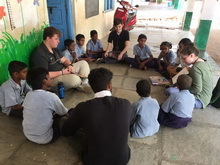 KMRF in partnership with Sreenidhi International School facilitated the whitewashing of the entire primary school campus in Aziznagar.The village school also was requested for the painting of alphabets in both English and Telugu, parts of body etc. St. Andrews, Jackson, Mississippi, USA engaged in “ Mural painting” of village school class rooms and outside wall as part of their“Exchange Program”. The painting was done under a theme chosen and executed by the students assisted by the faculty of art from Sreenidhi. 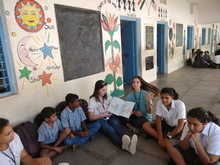 The village school students also participated in the painting program. In addition they organized a “Reading Program & Donation of story books” in the Primary school. 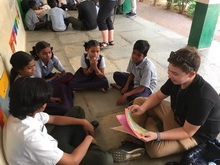 The grade 5 students were engaged in groups by both the students of Sreenidhi and exchange program visiting students. 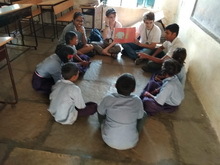 It was indeed a meaningful session that read out stories with pictures and played games with them. In the end they donated a book to each of the participants.